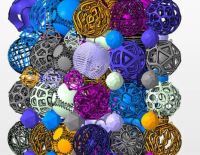 Get acquainted with parametric design - and design your own unique Christmas ball now! ABT continuously introduces digital solutions to achieve a better, more sustainable and more efficient design (process). For example, we are increasingly using parametric designs for our projects. We would like to introduce you to parametric design in an accessible way - appropriate to this time of the year! Choose one of the designs below (use Firefox or Chrome for this). You can configure your Christmas ball according to your wishes and you will directly see the result. You can download a 3D file and - if you would like - have your Christmas ball 3D printed yourself. All the above designs have been designed by ABT colleagues with the help of the computational design group. Do you want to know what parametric design can mean for your project? Continue reading on the computational design page and contact us. For now, we wish you a lot of fun designing the Christmas Ball! Made possible by Shapediver and 3D Print Lab.